29 November – The Department of Environment (DoE) is urging members of the public to abide by the National Conservation Law (NCL) as Cayman’s lobster season opens on Saturday, 1 December. The open season spans three months between 1 December, 2018 and 28 February, 2019. During the open season, there are strict rules regarding how many lobsters, and of what size, can be taken. 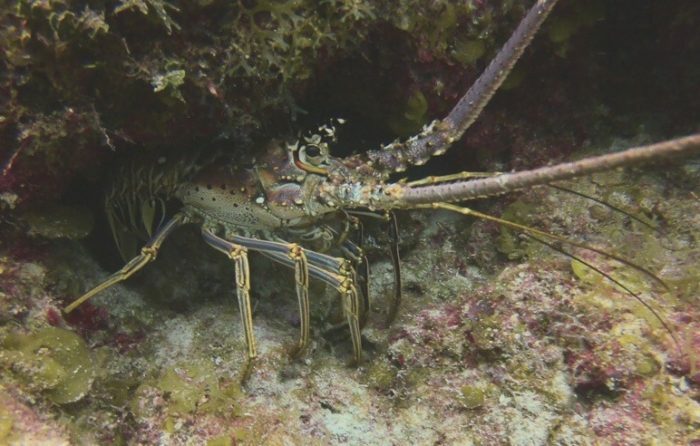 Lobster may only be taken from outside marine protected areas and only spiny lobsters (Panulirus argus) may be taken. Any lobster taken must have a minimum tail length of six inches. There is a take limit during the open season of three spiny lobster per person, per day, or six spiny lobster per boat, per day – whichever is less. In addition, anyone who takes, purchases, receives or offers for sale, exchange or donation more than three lobster per day from Cayman Islands waters commits an offence under the NCL. Anyone who possesses more than three lobster per day, or allows another person to take, more than three lobster per day from Cayman waters also commits an offence. The Law also bans the taking of lobster, and all other marine life except lionfish, while SCUBA diving. Using gloves, a spear or a hook stick to catch lobster is also unlawful at any time. The preferred method of catching lobster is with a snare. Lobster snares, which can be purchased locally, allow users to humanely catch lobster and also allow the harmless release of any undersized lobster. “If you see a lobster and you are in doubt about the size and whether it is legal to take, to be on the safe side, it is probably best to leave it and look for a bigger one,” said DoE Manager John Bothwell. The DoE also asks that individuals catching lobster avoid, to the extent possible, taking females. Females can be easily identified as they have two “toes” on their hind/bottom legs nearest to the tail and will often have a black, slimy substance attached underneath them in the area between their legs. “All members of the public who are involved in lobster-catching must obey these rules and support our efforts to preserve this species for future generations,” said Environment Minister, the Hon. Dwayne Seymour. If anyone sees, or becomes aware of, suspected lobster poaching, or suspects someone is purchasing more than the legal daily limits, they are asked to call 911. Individuals may also contact DoE enforcement officers directly on Grand Cayman (916-4271), on Cayman Brac (call 911) or on Little Cayman (925-0185).